WASHINGTON, DC, May 25, 2011 (ENS) – Redesigned fuel economy labels for all new cars sold in the United States provide facts intended to save drivers money at the pump and prevent air pollution. Starting with model year 2013, the improved fuel economy labels must be placed on the windows of all new passenger cars and trucks  both conventional gasoline powered vehicles as well as advanced cars, such as plug-in hybrids and electric vehicles. The new labels are required by the Energy Independence and Security Act of 2007. Unveiled Wednesday by the U.S. EPA and Department of Transportation, they represent the greatest change in new car labeling in the 30 year history of the program. 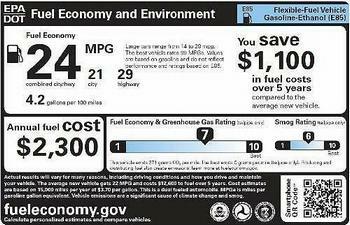 The redesigned fuel economy label will be on all new cars and light trucks starting with the 2013 model year. Easy-to-read ratings of how a model compares to all others for smog emissions and emissions of greenhouse gases that contribute to climate change. Information on the driving range and charging time of an electric vehicle. A QR Code that will allow users of smartphones to access online information about how various models compare on fuel economy and other environmental and energy factors. Shoppers can scan the QR code with their smartphones to store that vehicle’s information, compare it to other vehicles, and access www.fueleconomy.gov for even more information. On the website drivers can enter information about their typical commutes and driving behavior to calculate a more precise estimate of fuel costs and savings. EPA Administrator Lisa Jackson said the new labels underscore the benefits of the historic, bipartisan passenger car and truck fuel economy rule adopted by the EPA and DOT in 2010. The 2010 fuel economy rule, developed with input from major automakers, environmental groups, and the states, will increase the energy efficiency of cars and trucks built in model years 2012 through 2016 to 35.5 mpg by 2016. It is expected to save 1.8 billion barrels of oil over the life of the program and save the average driver $3,000 in fuel costs. But one thing the new labels fail to do is give cars letter grades for fuel efficiency performance of new cars and light trucks. This format was considered and tested in focus groups but rejected, to the disappointment of some citizens and environmental groups. But Jackson said the letter grade idea was not popular in consumer tests.